Labor Day has come and gone, so it’s back to the books for students young and old. To show our school spirit we’ve created this short and sweet pop quiz (we’re such easy teachers; we’ll give you an A just for trying). The subject is history, or to be more specific the history of a few of your favorite modern desserts. We’ve divided the quiz into 3 parts (stay tuned for more questions). No need to cheat as we’ve provided the answer at the end of this post. Question 1: What country started the salted caramel trend? According to a New York Times article, the trendy flavor pairing originated in France, or specifically Brittany, where heavily salted butter caramels are a common indulgence. Playing off of this tradition, ever-inventive Parisian pastry chef Pierre Hermé invented a salted caramel macaroon that inspired a cult following among American food professionals in the late 1990s. Meanwhile, a parallel trend, salted chocolate, began when Hermé sprinkled chocolate with fleur de sel, a flaky salt hand-harvested from marshes in Brittany. 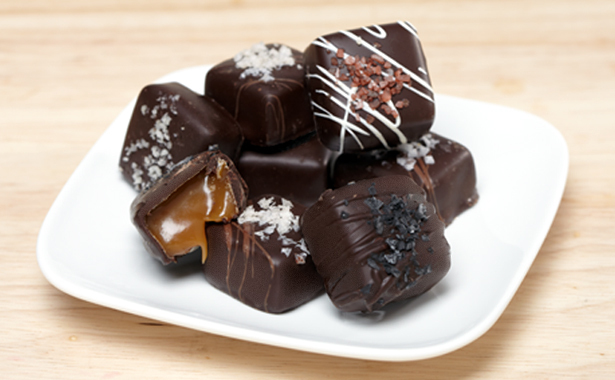 In 1998 San Francisco chocolatier Micheal Recchiuti put the two together and started selling his own fleur de sel caramels covered in chocolate. The trend made its way from New York pastry chefs to mainstream menus when food-forward chains began selling salted caramels in 2007.